With a marina providing access to some of North Carolina"s best fishing spots, a secluded camping area beneath towering trees, and miles of hiking trails that traverse a variety of distinct habitats not to mention the presence of the Venus flytrap, one of the world"s most unique carnivorous plants it"s no wonder Carolina Beach State Park is a popular coastal attraction. Located in an area steeped in both history and natural diversity, the park includes a visitor"s center with exhibits depicting the wonders of its environment. 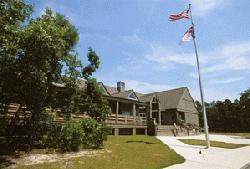 Visit Carolina Beach State Park to relax, enjoy nature or embark on an eye-opening adventure. Carolina Beach State Park offers access to a variety of waters. The fresh waters of the Cape Fear River, the estuarine waters of Masonboro Sound and the salt waters of the Atlantic Ocean are all only moments away. A marina with two launching ramps and more than 40 boat slips is located at the junction of Snow"s Cut and the Cape Fear River. Fuel, snacks and restrooms are available in the marina building. Showers are provided for slip renters. Family Camping: The park"s family campground is located in a wooded area near Snow"s Cut. Pine and oak provide shade for 83 campsites, including two wheelchair-accessible sites. Each site is equipped with a picnic table and grill. Drinking water and restrooms with hot showers are located nearby. Campsites are available on a first-come basis for a modest fee. Hookups are not provided for recreational vehicles, but a dump station is available for a fee. Group Camping: Two camping areas for organized groups are located along Swamp Trail and are available by advance reservation only. One site accommodates up to 20 people; the other accommodates up to 35 people. These areas include picnic tables, fire circles and pit toilets. Water and shower facilities are not available. 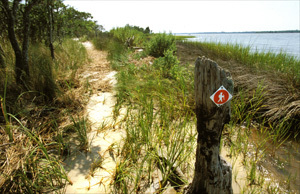 Hiking, more than six miles of trails wind through a variety of distinct habitats at Carolina Beach State Park. Relatively flat and easy to walk, the trails offer an opportunity to observe the diversity of plant and animal life in the park. Insects may be annoying during the warmer months; repellent is recommended. Visitor"s center, in addition to the multiple educational programs offered at Carolina Beach State Park, the park visitor"s center features environmental education exhibits. Carnivorous plants dominate the exhibit hall at the Carolina Beach State Park visitor"s center. The hall, open from 8 a.m. until 5 p.m. daily. Displays allow visitors to look deeper into the diversity of carnivorous plants in the park. From Venus flytraps to pitcher plants, from butterworts to bladderworts, the hands-on exhibits allow for interactive learning about these intriguing species. Boat ramp: $5 per launch. Camping in non-electric sites: $15 per day, per site; $10 per day for senior citizens ages 62 and older. A picnic table and grill are located at the campsite. Water, restrooms and shower facilities are located nearby. A dump station for RVs is provided free of charge to campers. Group campsites: $1 per person with an $9 minimum. Picnic tables, fire circles and pit toilets available. Dump station: $12 for non-campers. March, October, 8 a.m.-7 p.m.
April, September, 8 a.m.-8 p.m.